I have master’s degree in zoology and a doctorate in genetics. Being a conservation and evolutionary biologist allowed me to explore my deep curiosity about how and why animals do what they do. My research has been published in many peer-reviewed scientific journals. I have taught genetics at several universities in the Portland area. Being a scientist starts with observing nature and wondering just what the heck is going on. The next step is figuring out all the possible explanations and designing experiments to sort out the right one – this part was creative enough to satisfy my artsy side. I also liked carrying out the experiments by collecting data carefully and completely. Always a math-head, I thought statistical analysis was pretty fun too. The last part is writing – telling the story to other scientists. What happens to birds’ nests when forests are cut into smaller and smaller chunks? Do predators find them more easily? Why are male Blue Grosbeaks blue? Does being the bluest male on the block mean anything? What can marine copepods tell us about climate change? Does feeding mealworms to wild Western Bluebirds help them or hurt them? 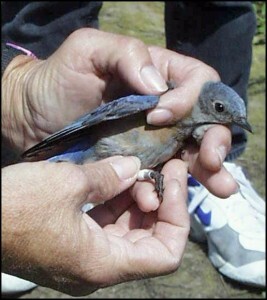 What caused a fatal epidemic in Western Bluebirds? Parasites? Infection? Charmantier, Anne, A.J. Keyser, and D.E.L. Promislow. 2007. First evidence for heritable variation in cooperative breeding behaviour. Proceedings of the Royal Society of London, Series B 274:1757-1761. Shawkey, M.D., S. L. Balenger, G. E. Hill, L. S. Johnson, A. J. Keyser, and L. M. Siefferman. In press. Mechanisms of evolutionary change in structural plumage coloration among bluebirds (Sialia spp.) Journal of the Royal Society Interface. Estep, L.K., H. Mays, A.J. Keyser, B.E. Ballentine, and G.E. Hill. 2005. Effects of breeding density and plumage coloration on mate guarding and cuckoldry in blue grosbeaks (Passerina caerulea). Canadian Journal of Zoology 83: 1143-1148. Keyser, A.J. and L.M. Siefferman. 2005. Viability selection against highly-ornamented males. Evolutionary Ecology Research 7:595-606. Keyser, A.J., M.T. Keyser, and D.E.L Promislow. 2004. Life history variation and demography in western bluebirds (Sialia mexicana) in Oregon. Auk 121:118-133. Keyser, A.J. 2002. Nest predation in fragmented forests: landscape matrix by distance from edge interactions. Wilson Bulletin 114: 186-191. Keyser, A.J. and G.E. Hill. 2000. Structurally based plumage coloration is an honest signal of quality in male blue grosbeaks. Behavioral Ecology 11: 202-209. McGraw, K.J., G.E. Hill, and A.J. Keyser. 1999. Ultraviolet reflectance of colored plastic leg bands. Journal of Field Ornithology 70: 236-243. Keyser, A.J. 1999. Condition-dependent variation in the blue-ultraviolet coloration of a structurally based plumage ornament. Proceedings of the Royal Society ofLondon, Series B 266: 1-7. Keyser, A.J., G.E. Hill, and E.C. Soehren. 1998. Effects of forest fragment size, nest density, and proximity to edge on the risk of predation to ground-nesting passerine birds. Conservation Biology 12: 986-994.